Ok I know VS 2010 is the new toy to be seen playing around with, but as I have just recently got delivery of my new Windows 7 pc I thought I would document how to get WinMerge to work as a comparison tool with VS2008 Team System. If for anything, so I know myself when the time comes to do it all over again. Team Foundation Server does have a built in comparison and merge tool, but personally I find WinMerge to be far better. Oh and it is free. 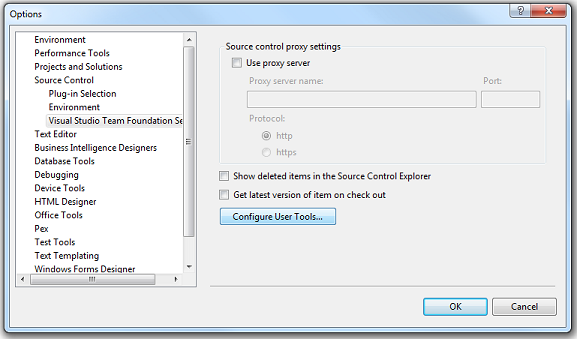 Click the ‘Configure User Tools’ button. 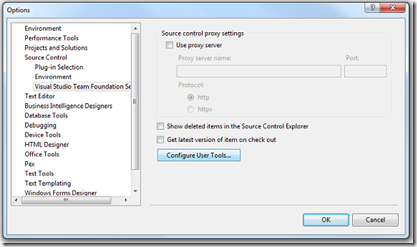 Click on the ‘Add’ button on the ‘Configure User Tools’ window. Click OK all the way back down to get back to the main IDE. 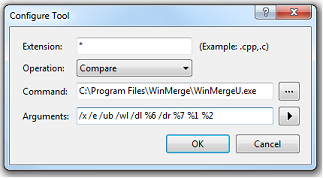 Now when you view a file history from Solution Explorer it will start up WinMerge. 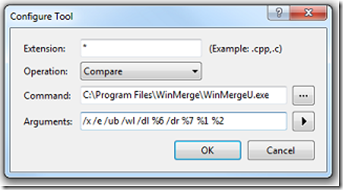 Since WinMerge can compare directories, it is also a good deployment tool. Point it at the development directory and the deployment directory and you can see which files have been modified. You can then compare and optionally copy the files to the deployment directory. @SGWellens - That is great, I didn't even know it could do that. Thanks. How well does it handle resx and proj (xml) files? Can it merge resx when two people have each added a resource entry or added a file to the proj? You can also use it for merging which is where it gets really powerful. Forgot to mention, my post also has a reg file that will configure all this for you. @primrose - Thanks for the pointer Rory.